Il Piatto is not for the faint of taste. With very strong flavors, this Italian is for the gourmand. Which, sadly, Spousal Unit and I are not so much. ...there is such a thing as too much mushroom. The Risotto al Funghi was far too strong, and was an exceedingly unappetizing grey color. I know one shouldn't judge a book by its cover, but with food, appearance counts! My smoked salmon ravioli in a lemon cream sauce was done perfectly, but again, a little strong for my taste. A true foodie would no doubt have absolutely loved it. The ravioli was a surprise--I expected cheese or another filler with salmon there for flavor, when in fact the filling was salmon all the way. And excellent salmon at that. The capers were a bit overdone, and certainly overwhelming with the already quite tangy lemon cream sauce. 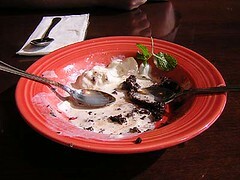 What saved this whole meal was dessert. Il Piatto's chocolate torte is the stuff of dreams. Perfectly balanced, rich, with a flavor that keeps changing and deepening as a bite is held in the mouth. I also got a taste of the Spousal Unit's Orange and Chocolate Cassatta, which was much lighter, and a well-balanced blend of citrus and chocolate. I believe I detected a hint of hazelnut as well. We will probably order again, but only dessert. Our peasant palates were overwhelmed by the rich flavors of Il Piatto. Okay, it wasn't the best, but they were handy, and I used to like them, but after a more recent lunch and dinner there, I've realized that La Terrazza is no longer the yummy corner it once was. The first clue left me, frankly, aghast. Our server came over to our table, introduced herself, and wrote her name in crayon on the paper table covering. She even wrote it upside-down so we could read it. Did I land at Chuck-E-Cheese's? Was this not a winelist and a nice cloth napkin I saw on the table? She continued hover and laugh at inappropriate moments (for those who are wondering: no, I don't blame her, and we tipped well as usual) as she brought me a strip-steak two temperatures overdone (I didn't bother sending it back, as the whole meal was looking doomed), and Bill a pasta primavera that gives new meaning to the word "uninspired". My reaction after the meal: "I can get cardboard at home." It really was that bland, from bread to sauce. They used to have great sauces, fresh veggies, and good care taken in the kitchen. All that is gone, and so am I.
Oh, but this was goodgoodgoodgoodgood. Wonderful food and great vegetarian options make this a keeper. Arancini is a "saffron rice fritter stuffed with a ragout of zucchini and eggplant with fresh mozzarella". This is now tied for favorite appetizer with Porto Terra's stuffed artichoke hearts. It is a delicately crispy Sno-Ball of mellow rice, filled with a creamy blend of savory veggies. Foodgasm Central. My steak (boy, I order that a lot) was excellent. Just the barest bit unmoist. It was even the correct temperature, despite being delivered. It came with tasty sauteed spinach, and heavenly mashed potatoes. Bills' Basilico e Mozzarella was also delicious. A simple blend of penne tossed with tomatoes, basil, mozzarella, and garlic, it was skillfully prepared, each flavor cooperating perfectly. While it won't replace Porto Terra as our favorite, Bastas will probably be our first choice for Italian from Delivered Dish. It's been about a month since we went to Romano's, and I keep forgetting to write about it. Normally, we'd just go again so I could have a fresher impression. This is not an option. Not that it matters--I remember the experience (with the exception of what, exactly, I ate) quite well. The Spousal Unit was miserable. His allergies were acting up, and he was sneezing his poor beleaguered brains out as we bussed to the restaurant. We were looking forward to a clean, air-conditioned atmosphere where he could recover. Unfortunatly, Romano's is rather like being at a barbeque. The entire restaurant was filled with a smokey haze from the grill. Whether this is ambiance or design flaw, I do not know; I only know that it was extremely unpleasant. The meal was exactly what one would expect from a national chain--straight middlin'. Nothing wrong with it, but nothing exceptional. I enjoyed the stuffed portabello very much. Bill's pomodoro was edible, but nothing like he's used to (from Porto Terra), and my steak (I'm pretty sure I had one--ah, fickle memory), was adequate. Nothing that would inspire us to again brave the (bbq) pit and the friendlylum. I do feel for the waitstaff there. We tipped well and fled. I had high hopes for DeNicola's, as I remember wonderful meals there as a child. Sadly, I think my tastes have matured. Bill's pizza was made from the cheapest veggies, and the garlic was from a jar. It was good, he said, but not great. My pasta was fine, but again, the ingredients were not the best. The cake was also good. But here's the thing: it was nowhere near good enough to justify the price. This is average food, in a town where I've come to expect better. There's a lot of great Italian in Portland, so there's no reason to try DeNicola's again. Kitty-corner from work, they have great ravioli pesto. Penne alla zuccha is another fave. Bill likes the penne alla primavera. Very fast service, bright, casual atmosphere. This is the best dessert ever. Well, so far. Solid Italian, haven't been disappointed by anything thus far. Be careful of the table in the corner--it's too low. Nice ambiance, food, bleah. There was too much gorgonzola in my homemade ravioli, and too much oil in Bill's risotto. No good reason to go back. Portland is a city of restaurants. Really, really good restaurants. Mediocre food doesn't survive for long in our competetive market. I love this place. The hubby and I have developed a habit of trying at least one new restaurant per week. Because we live in the River District, we're unlikely to run out of new places--within walking distance!--in my lifetime. Last night's foray was to the delightful Piazza Italia, at about 11th and NW Johnson in the Pearl. The Piazza has a very casual, cafe-like atmosphere. Thursday is Italian-only night, but you'll still hear mostly Italian on any other night as well. The lighting is bright, and soccer plays on a television in the corner. Prices are very reasonable--dinner and dessert for two was about $30. And oh, what a dinner. Bill and I both had specials, of which there were several. 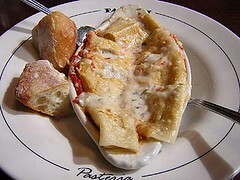 He went for the puttanesca bolognese, and I had the lobster ravioli in a light cream sauce. The flavors were strong--Bill's puttanesca was full of wonderfully pungent olives, mushrooms, and anchovies. The ravioli was sneaky--only after chewing for a second or two did I get the "oooh--good lobster!" sensation. We usually share a dessert, but we couldn't resist trying two here. We naturally had to try the cannelloni, but I'm a big gelato fan, so we had the cherry gelato as well. The cannelloni was very good, but the gelato made my eyes roll back into my head. Excellent. Piazza Italia also embraces one of my favorite restaurant practices: feed one person, not six. I loathe the American habit of serving enough food for a small independent nation. 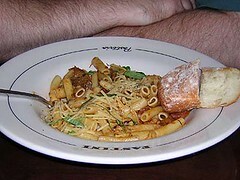 Piazza's servings are perfect for the flavor and richness of the dishes. Great service, casual atmosphere, and authentic cuisine makes Piazza Italia one of our favorite finds so far.